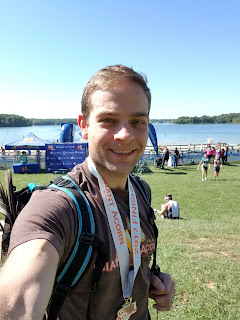 We got to Lake Anna a bit before 8, leaving plenty of time for my packet pickup and to set up my transition area. I also heard the news that the lake temperature was such that it would be a wetsuit legal race. I had packed my wetsuit, but since I had never actually swam in it, I was unsure if I would actually use it for the swim. I figured I could make that decision after I set up my transition area. 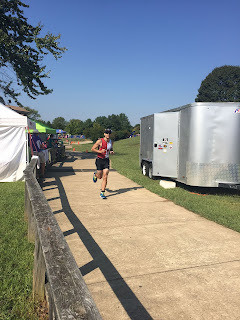 I think I was in the exact same rack as I was the last year I ran this race, which made the navigation in the relatively large transition area just that much easier. I had a few issues with rubber bands snapping when trying to prop up my bike shoes, but otherwise the setup was uneventful (I don't know what kind of event there would be, so I guess it's good that there was nothing noteworthy). I then changed into my tri suit and convened with my wife, daughter, and sister. I made the decision to use the wetsuit. I figured I might as well see what all this hype was about in terms of increased buoyancy. I even practiced getting the wetsuit off just to make sure it would be manageable in T1. It was only 66° at the pre-race meeting, but with the sun out and no clouds in the sky, it felt more like it was mid-80s, and I was sweating before I even made it down to the beach. I was in the second wave of swimmers for this 1500 meter out and back swim. The first wave consisted of collegiate athletes (no representation from my alma mater this year!). Four minutes later I was off. I didn't warm up prior to the swim, so getting into the water was an odd sensation in the wetsuit. It did it's job, obviously, but I didn't expect it to do it so well. It insulated me so well that it didn't even feel like I was in water. I quickly became a believer in the added buoyancy of wetsuits, but I wasn't sure how that would translate into results. I felt good during the swim and was able to breath every three strokes with an occasional pause for sighting . Last year I was breathing every other stroke and felt panicked. Just like last year, the swim seemed to take forever. And just like last year, my goggles fogged up. On the return trip, I couldn't see the buoys and ended up veering off course to the point that a kayaker had to stop me and let me know that I was off course. To be fair, I was getting lazy on the sighting since I really couldn't see much, but I was much more diligent after that encounter. I got out of the water and over the timing mat in 28:55, a full 7:34 faster than last year. I guess the wetsuit really does make a difference. Or maybe it's the fact that I had a few open water swims under my belt. Once over the timing mat, the transition takes you up a sidewalk into a field on the side of a gently sloping hill. On the way there were people with wetsuit assists. Unfortunately, I didn't realize they were there until after I was already 10 feet past them, and by that point I didn't want to turn around. I continued up the sidewalk to my bike and struggled mighitly to get my wetsuit off. However, while it was a struggle it was not insurmountable and I got it done in what seemed like a reasonable amount of time. I put on my helmet, sunglasses, and race belt and started running with my bike to the T1 exit. My T1 time was 2:09, which was actually faster than my wetsuit-less time last year by six seconds. Go figure. I got to the mount line and hopped onto my bike, only to realize that I forgot to leave my shoes un-velcroed, so they were shut. And since the start of the bike course consisted of a mile uphill, I wasn't able to finagle my feet into my shoes while mounted, so I pulled over, un-velcroed my shoes, struggled to put my first foot in, and then started peddling as if I had done the mount correctly the first time around. I don't have a power meter on my bike, so I essentially just ride by heart rate and feel, and I felt pretty good. This course has some pretty big rolling hills. Immediately after the one mile uphill to get out of the park, a pretty good downhill starts that had me going nearly 35mph. It's those sorts of hills that truly make you appreciate aero bars. My calves cramped up several times over the bike but I got back into the transition area in what I felt was a pretty good time. It ended up being 1:18:12, which was a few minutes slower than the year before. That's not really too surprising considering I got on my bike one time in the month prior. The most important thing is that I felt good getting off the bike, my legs felt pretty fresh. T2 was nothing special. It took me 59 seconds, which was 14 seconds faster than last year. If you're keeping track at home, I'm now at 1:50:15 for my total time heading into the run, ahead of my time last year by 5:20. My only goal for this race was to improve from last year. 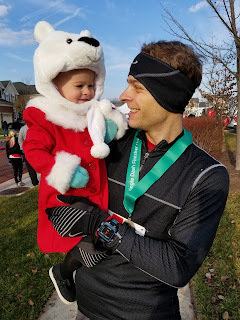 As I started up that mile long hill to start the first of two laps of the run course, I told myself a sub-50 minute time on the run would be just fine. I didn't want to stress myself out too much. The first lap actually went better than expected. I don't know what the time was because the run portion of my garmin file got corrupted, but I'd guess it was right around 23 minutes. The second lap saw me run by my family and then back up that mile long uphill. It wasn't 200 meters into the hill that I started to bonk. My legs started seizing. Specifically my Vastus medialii (i.e., the inner part of my quad near my knee) on either leg. I had to stop running and eventually I had to stop walking to massage them out. Essentially from that point on, all hills, no matter how small were a walk/run. This stress on my body also caused my heart rate to skyrocket and even on the downhills I was doing about a 9min/mile pace at a heart rate that would ordinarily have me going at 7:30 on flat ground. I did manage to finish the race, but it's the first time in years that I've had to walk portions of a race. It was really disheartening. I'm blaming it on a lack of hydration (or maybe some electrolyte issues). I think next year I'll have to put some sort of energy drink in one of my water bottles. Or maybe I just need to do longer training sessions, especially in the heat. After all, I think the longest training session I've done this calendar year (excluding swimming) was barely over an hour. As I mentioned, I did finish the race. If my first lap was 23 minutes, my second lap was 33 minutes, making my run time 56:56 and almost 10 minutes slower than last year. Overall I was 4:28 slower than last year. This is the first race I've had a slower time since I started tracking my triathlons in earnest nearly six years ago. That said, I am chalking this one up to injury and not a lack of fitness (though that's certainly debatable, I'm just trying to keep my pride intact). Overall the race was a lot of fun. My body felt pretty broken after (and the days after as well), but I'll do this race again next year. 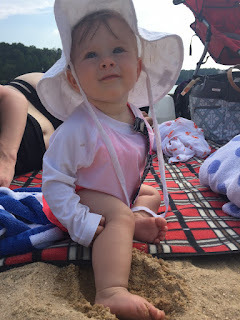 And the best part of doing the race was that after, my wife, daughter, sister, and dog got to relax on the lakefront beach for a few hours. Nothing like some serious lounging after a serious physical effort.